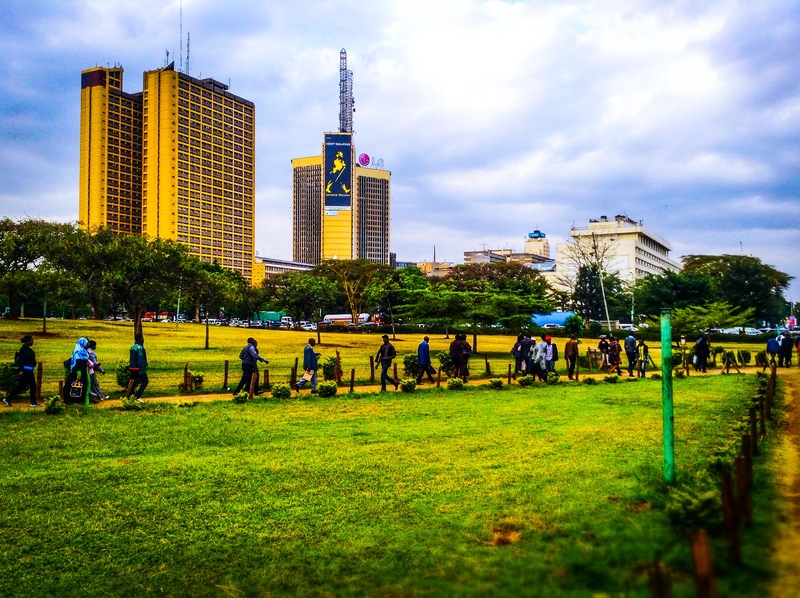 A walk to Nairobi’s central Business District from Ngong Road can mean several things to different individuals. To some it could be a lack of enough disposable cash for double transport, some could want to keep fit while another crop could be the time sensitive type who avoid staying in traffic for an hour or more and opt for the 30 minute walk. – Kenya is a walking nation despite the reason. I have often taken the stroll to town through Uhuru Park- the recreational park synonymous with the legacy of the late Prof. Wangari Mathaai. In 1989-1990, Wangari under the Green Belt Movement led a public outcry against the government’s plan to build a 60 story Kenya Times Media trust Complex. Thanks to her brave efforts, we still can enjoy the serene atmosphere in the concrete jungle that’s Nairobi. Looking at the Kenyatta Hospital Bus stop, I don’t see the hopes of finding a vehicle and reaching home early enough. “Easy, walk… but on second thought, it is 6.45 p.m. This means I will have to pass through the park after nightfall,” I ponder. Right then, stories of the muggings and killings along Uhuru Highway flooded my mind. “Why don’t we walk, will you wait for these vehicles that are nowhere to be seen?” I hear a man in the crowd of waiting travellers asking a lady friend. This gives me courage; I follow their stride with the assurance of Solomon’s wisdom that two are better than one. We advance past Ngong Road and soon we reach the Kenya National Library Building, bordered by the NHIF towers. Getting to Afya House, it is already dark and I have lost track of my walking companions. Just at the middle of Ngong Road and Cathedral Road, there are still women hawking their wares. On the right are sweet potatoes arranged in piles and on the left is white nylon paper bag containing green boiled maize. I am slowed down by my appetite at the tantalizing aroma of boiled maize. “Sema nikuuzie,” the heavily built woman says to me. Cob of maize in hand, I gain momentum and advance into the park. Silence, save for a few people who are descending the stairway into the park talking in hushed tones. Digging my teeth into the maize keeps my mind off the horror that could happen at 7 p.m. in the park. Getting to Ceremonial Driveway, a sizeable number of people join in the journey. Safety assured. pass through here. This is why I opened this business,” says Kamau, a soda vendor who is packing the soda bottle in the portable red Coca-Cola cooler, winding up after a day of great sales. The City Council public lavatories have been closed, and so is the merry-go-round area that is usually busy with children on weekends. There are no school busses parked either. This is usually a must report to venue for anyone new to the city- including upcountry school. Otherwise stories of having visited Nairobi would lack their luster. The skyline looks breath taking with sky scrapers such as Nyayo House, Laico Regency hotel and the Inter-Continental hotel- the lights add to the aesthetic appeal for any photographic mind. Tele-poster Towers gives me motivation to keep walking with the huge Johnny Walker walking with us. Advancing toward the artificial lake, I can hear sounds of fish plunging into the water, ruffling its peaceful surface. I tread carefully near the short barbed wire fence, as far away from the water as possible. “I don’t want any mishaps to occur- suppose I fall into the lake with my wanting swimming skills, who will save me?” I ponder. A safe distance from the lake, I glance back at it and I can’t help but think of the night photos of Canal Saint-Martin in France. Though I have never been to Paris, the light falling on the water from neighboring Afya house gives me an illusion that we have a replica of those great places right at the heart of Nairobi. I follow a route that has a handful of persons. There are several walkways bordered by short barbed wire fences snaking through the park. Safety in numbers is my guiding principle. At least I have managed to cross the park without any unpleasant incident. The deserted City Council lavatory at this side of the park bids me farewell. I breathe a sigh of relief as the cool breeze hits my face one last time. This is a place that fits anyone’s budget. As a family, you can come for a picnic with packed snacks. For those whose pockets are not deep enough, the park is open as a resting place after a tiring tarmacking endeavor. For creative writers like yours truly, it provides a serene environment for ideas to flow freely. Other people call it the lovers’ park due to its popularity with couples spending quality time together on a low budget. Uhuru Highway is heavy with traffic- quite literally. Heavy commercial trucks are lined one after another waiting for the traffic lights to hit red. While crossing, I feel like Moses and the Israelites in the middle of the red sea as the Road-Tainers tower on both sides of the Zebra crossing. The roundabout city clock at indicates 7.15 p.m.
What would the situation have been, were it not for the mother of trees? British Media mogul Robert Maxwell and the Moi regime could have had their sixty story tower and it would be history- a park that was. That’s why the 2004 Nobel peace prize was a well-deserved accolade for the environmental hero. Words are spirit and life therefore give life. Which words do you listen to? The word affirms my position as a royal diadem. Listen and be transformed by the renewing of your mind. Telling it, a story at a time. Link in bio. More to reality than old parchments and desiccated bottles of ink! Exploring Kenya one pixel at a time!